An aerial image of the Arboretum in 2012 after the drought and Hurricane Ike. 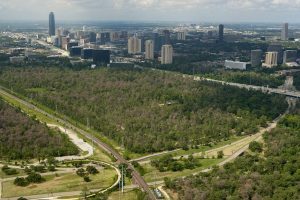 In 2008 and 2011, Hurricane Ike and a culmination of a multiple year drought significantly impacted the Houston Arboretum & Nature Center. These two major natural disasters resulted in a devastating loss of almost half of the Arboretum’s mature trees, allowing invasive species to encroach, and revealing a significant need for a healthier ecosystem. Since then, we have been working to develop a Master Plan that would both make the Arboretum’s grounds more sustainable and allow us to reach even more Houstonians through our year-round educational programming. After many years of preparing for the ecological restoration of the site and the expansion of public amenities, Master Plan implementation is about to begin. At the beginning of March we started to clear the invasive understory for the first phase of our project – a new woodland parking loop with an entrance along 610 and a much needed expansion of the Arboretum’s conservation facilities. As part of our preparation, this clearing process was tested over the last two years in two different parts of the Arboretum: a savanna restoration pilot and a woodland restoration pilot. During this time we learned a great deal about how to best protect the site, be as efficient as possible, and inform design decisions for large scale implementation. As a whole, the two pilot sites have responded positively to the clearing. 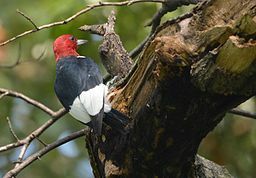 Wildlife such as the Red-headed Woodpecker have been identified for the first time on site and desirable plant species such as the carnivorous sun dew have come in on their own. These key indicator species let us know that we are moving the site in the right direction. The first step of the restoration process is to remove smaller invasive plant material, mimicking the natural fire regime that would have occurred historically. Small scale disturbances are an important tool when restoring ecological function and will result in a more resilient site in the future. Existing shortleaf pines and post oaks will now have more space and light to flourish and hopefully regenerate, ultimately restoring a portion of the canopy that was lost in the hurricane and drought. After clearing, the conservation team will spend some time controlling invasive species in order to prepare the site for construction and replanting. In early fall, it is projected that replanting of this area will begin according to the planting plan we formulated in conjunction with our landscape architects. The interior of the new 610 parking loop is slated to be primarily a woodland restoration and will be seeded with a woodland seed mix and a variety of different tree species. The plan focuses on increasing the number of tree species and improving vegetation structure. Please keep in mind it will take some time for the ecosystem to become established. The site will look significantly different during the construction and restoration process, however the end result will be well worth the wait. The Arboretum is going through a transformation. Eventually it will be in a more sustainable and resilient ecological state and provide an unmatched experience within central Houston. Thank you for your patience and continued support throughout this process. Please check our website periodically for information regarding trail closures and updates.